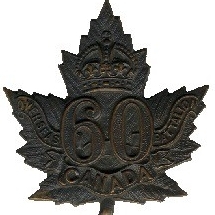 August 1915 – The 60th Battalion C.E.F. "Victoria Rifles of Canada"
E Company sailed from Quebec City on board the S.S. Scandinavian, bound for England. The men of E Company, officially known as the 60th Canadian Battalion, 1st Reinforcing Draft, all transferred to the 23rd Canadian Reserve Battalion in England, destined to become reinforcements for units already in France.